Drain and manhole cover accident – Can I Claim Compensation For A Injury? When you are walking around in public, going about your busy life, the last thing you expect is to trip or fall because of a faulty drain and manhole cover. These covers are designed to protect the public from the holes in the road and pavement but if one if broken, faulty or missing then it could become a serious hazard. Manhole/ drain cover compensation claims aren’t uncommon as slips and trips due to a faulty drain or manhole cover can leave you with serious injuries and in severe pain. It is the responsibility of the council or landowner to maintain the pavement and this includes drain and manhole covers and so claims against you the local council for personal injury can be processed as the are liable for any injuries sustained due to unmaintained covers. 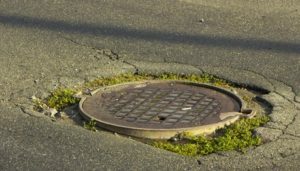 Drain and manhole cover injury compensation claims can be complicated and so it is advisable that you advance with any claim with the help and guidance of a legal expert. If you are wondering “how much of a compensation payout could I get for a drain / manhole cover injury?” then this guide should be able to give you some idea of what your claim might be worth. If you have suffered as the result of an accident over a broken, faulty or missing drain or manhole cover then contact Accident Claims UK on 0800 073 8801 today and one of our dedicated team will be able to guide you through your next steps. We will put you in contact with an experienced solicitor who will be able to represent your case for you in your claim for compensation after a manhole cover accident. Who is the responsible party for the maintenance of pavements, including manhole covers and drains? If you have sipped or tripped over a broken or missing manhole or drain cover then you may be awarded compensation as a result of any injury you sustained. The local council have a duty to maintain the pavements and roads so that they are safe for the public and any dereliction of that duty can mean that they are liable should you have an accident as a consequence. Slip and fall compensation amounts do vary and any compensation you may receive will depend on your individual circumstances but claims against the local council for personal injury are often successful. Other causes for drain & manhole cover accidents can be workmen leaving manhole covers open or ajar and not putting up proper signage to warn the public. This would make the workmen and their company liable for your accident and so you may be able to pursue a personal injury compensation claim against the company. This guide will give you all the information you should require to fully understand manhole/drain cover compensation claims and the processes involved including what you can have in the claim and how the claim will work. Accident Claims UK can help connect you with a specialised solicitor to represent your cause in your claim for compensation. There are several responsible parties for maintaining pavements and drain or manhole covers to make sure that they are safe for the public to be around. Should the drain or the manhole be owned by the local water or sewage company then it is their responsibility to ensure that the cover is properly in place, functioning as it should and is maintained to a safe standard. It is the responsibility of the local council to ensure that maintenance of the pavements is carried out regularly to ensure that they do not present a trip or fall hazard. This includes ensuring the condition of the pavement surrounding any manhole or drain covers is of a high standard, that there is no loose concrete and that the manhole or drain cover lies flush with the pavement. If you have had an accident as a result of the pavement not being maintained then the council may be liable for your accident and any injury you sustained. Should the manhole or drain cover be situated on a private road, then it becomes the responsibility of the occupier or the owner of that land to ensure that the area is safe and free of hazards. The majority of accidents caused by drain & manhole covers are usually slips, trips and/ or falls. While these sound like small accidents,slip and fall compensation amounts can vary wildly due to the severity of any injury sustained. Some slips and trips from drain and manhole cover incidents result in minor bruising, bumps and lacerations, some can be much more serious. Due to the nature of accidents caused my broken or missing drain and manhole covers, often victims suffer serious and complex issues including fractures, sprains, spinal and head injuries. Incredibly serious accidents can occur with manholes on roads, for example a cyclist getting their wheel stuck or a missing manhole cover causing a car to skid and crash. Misplaced, missing or broken drain covers are not limited to the road or pavement, you may also experience an accident with on in a public car park, hospital grounds, shopping centre, supermarket or leisure complex. No matter where your accident took place, if you suffered an injury as a result of a poorly maintained or missing drain or manhole cover then you might be able to put through a claim for compensation. In order to make a claim for drain and manhole cover injury compensation then you have to be able to prove that your injury occurred as the result of someone else’s negligence. For your claim to be successful you have to be able to prove that the party responsible for the maintenance of the drain or manhole cover(council, landlord or utilities company) neglected their duty to safely maintain standards and you suffered an accident as a result. If your accident occurred due to their being a defect with the drain or manhole cover and this defect caused you to slip, trip or fall, then you haveto show that the defect is at least 1 inch deep. Any less than that and your claim is unlikely to proceed as 1 inch is generally considered the minimum measurement for personal injury claims. There is also a time limit which applies to any personal injury claim. You have three years from the day of your accident, or the date your injury developed, in order to make a claim. Should you be outside of this time frame it is unlikely that your case will be heard. If the victim of the accident is a child, then you can claim for them but the three-year time period does not start until the child’s 18thbirthday. Under Section 58 of the Highways Act (1980), local councils have a legal responsibility to ensure that public roads and pavements are maintained to a safe standard and inspections must be carried out regularly. If your local council have neglected this duty and you have suffered a drain and manhole cover accident as a result, then you may be able to file a claim for compensation against the local council. In order for claims against the local council for personal injury to be successful, you have to have suffered a physical injury as a result of a drain or manhole cover accident. Suffering psychological or emotional trauma is not enough grounds to sue the council. If you were to have suffered an injury, it is important to get a thorough medical examination as quickly as possible in order to be able to prove your injury. Accident Claims UK can organise a medical examination with a local medical professional for you. Where appropriate, you should get any photographs of your injury as evidence for your claim towards the council. You should also try and get photos of the scene of the incident too so that you can prove the condition and circumstances surrounding your accident. Use rulers or perhaps some other implements of measurement to give scale. If you don’t manage to do this at the time, we will gather evidence on your behalf but it is possible that any faulty pavement, drain or manhole cover is repaired by the council after your accident. If your drain or manhole cover accident was on private property then the party responsible, and who you will name in your claim, depends on who is responsible for the maintenance of the property and surrounding land. Your manhole/drain cover compensation claims will name either the land owner or the property occupier, depending on the agreement about maintenance they have between themselves. The first thing you should do when you’ve had a drain and manhole cover accident is to report it to the relevant people. If it happened at work then your accident should be reported to management and logged in the accident book. If you have tripped or fallen over a broken or missing drain or manhole cover while on private property or public land such as a supermarket or leisure centre car park, then you should report the accident to the shop so that they can log it in their accident book. If you can, take photographs as evidence of where the accident took place so that you have proof of the poorly maintained drain or manhole cover in case is it fixed following your accident. You should also get a thorough medical examination to assess the full extent of your injury. Any emergency treatment you require following your accident won’t usually fully assess your injury and potential future complication so a full medical exam is advised to support any drain and manhole cover injury compensation claim. You will also need a duplicate of this medical report. If there were any witnesses to your accident then you should attempt to take any supporting statements and ask for contact details in case you require further support for your claim. Accident Claims UK can put you in touch with a specialist solicitor who can help you process your compensation claim for drain or manhole cover accidents. It is always advisable to seek legal advice before any claim begins as they can be complex and you are much more likely to see a successful claim result with the proper legal help. If you are wondering “how much compensation could I possibly claim for drain / manhole cover injury” then the below table should help to give you some kind of idea of the slip and fall compensation amounts that you might be able to expect from a successful claim. Every drain and manhole cover injury compensation claim are assessed on its individual merits. A court will consider the severity of your injury and the medical prognosis about how that injury is likely to affect you in the future. You may also be able to include any psychological trauma you have suffered as well as the costs of any medical care, specialist equipment and care as well as damages such as loss of income for time off work in your claim. This is why you are unlikely to find the exact amount you’re offered in any compensation calculator. There are simply far too many different things to take into account when your compensation award is calculated. This table serves to show the varying slip and fall compensation amounts and how much they can differ depending on the type and severity of the injury sustained. If you would like a more accurate estimate of how much your own drain and manhole cover injury compensation amount could be, call Accident Claims UK today and we will put you in touch with one of our team of solicitors who can go through your claiming detail. Please do not use the amounts above as anything more than a guideline, as there will be complexities to your case that will likely be different from the next case, and so on. If you have suffered an injury as the result of a drain and manhole cover being faulty or missing then making a no win no fee compensation claim is one of the best ways to ensure that you get the financial compensation you deserve with no financial risk to yourself. If you’ve been down on your wages because of the accident, and the time you have had to take off work, then you are hardly going to want to pay out large amounts of money to fund a case, especially if you are not one hundred percent sure that you will get a compensation award. As part of a no win no fee agreement, or conditional agreement, you only agree to pay for your legal support if your claim is successful. In the event that your claim is rejected then you will not need to pay a penny in fees to your solicitor. If your claim is successful then your solicitor’s fees will usually be either deducted from your pay-out or billed to the opposing side in your case. No win no fee claims help you to get the justice you deserve and financial compensation you are entitled to without risking any financial loss to yourself. Trips, slips and also falls are some of the most common types of accidents that people have, and while most injuries sustained from these kinds of accidents are mild, when you add a broken or missing drain or manhole cover into the equation, the consequences can be much worse and can cause injuries that you may not expect to ever encounter. Injuries sustained from drain and manhole cover accidents can vary from moderate sprains to severe fractures, back and neck injuries and head injuries. Many injuries will have far reaching consequences and life-altering impacts. In cases such as this, where there has been significant suffering and damages incurred resulting in time off work and a financial burden being placed on the victim, it is important to get justice and compensation. Making claims against your local authority/council for personal injury cases or going against utility companies who have neglected their duty of care can be intimidating and is always a challenge. This is why you need a legal expert by your side who has the competence and confidence to fight for compensation on your behalf. Accident Claims UK have a team of experienced legal experts who can handle all the aspects of your compensation claim, from start to finish, so that you can concentrate on recovering from your injury. our highly qualified team will start by talking to you about your drain and manhole cover case so that they have all the details before they begin providing you a solicitor that will help with organising a medical examination and chasing down evidence. Our no win no fee guarantee means that you won’t need to pay us a penny so there is no need to worry about further financial strains. Our team will focus on attaining the compensation you are entitled to. If you have had an accident and suffered an injury due to a broken, faulty or missing drain or manhole cover or poorly maintained pavement then call us today to begin your claim for compensation. Call us on 0800 073 8801 24hours a day, 7 days a week, and speak to a member of our dedicated team. You can also email us at office@accidentclaims.co.ukor fill out our enquiry form and a member of our team will contact you to discuss your claim. The UK Government have produced this page giving information on claims for pavement/manhole issues. Please remember, that it is almost always best to have legal advice before you pursue a claim. For minor injuries, the NHS has put together a handy page for you to find help. On it, it has a facility to search for injury units near you so that if you are walking but injured, you can go and get some assistance.